Every two years the world's greatest athletes meet up to determine who is the best in their respective sports, but the top-level competition always boils down to a few industrialized nations that have all the advantages. And with the exception of the John Candy film Cool Runnings, there are relatively few surprises. Well, since we face another summer olympics this week I decided to give some much-deserved recognition to those olympic hopefuls that fight against all odds by awarding some participation medals. First I would like to recognize the Japanese high jumpers, who have valiantly attended every summer olympics just to be beaten soundly by all other countires. This year's star jumper is Keiko Matsuo, the most decorated female high jumper in japanese history and standing at an incredible 5'2" tall, a full 3" taller than the next tallest Japanese competitor. She is expected to make it through to the preliminary round where she will be embarrassed by the rest of the field immedietly. For her efforts we award her the medal of participation. Next on our list of participation medal recipients is the Israeli beach volleyball team. They continue to show astounding resolve and courage to report to every match despite their genetically-inherited habit of becoming grossly disoriented when they come in contact with sand. 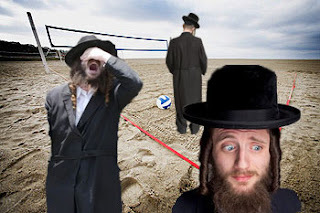 One is quickly reminded of Moses leading the jews through the desert for fourty long years when viewing the confused Israeli team, hunched over and bumping into the net the moment they enter the sandy volleyball pit. But they continue to proudly compete in the face of insurmountable opposition. We tip our hats, Israel! 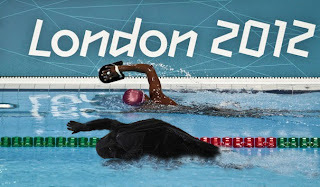 And finally we want to recognize Iraq's womens swimming team, who routinely finish several minutes behind their olympic rivals in every event, sometimes even paying the ultimate price and drowning before reaching their goal. But every spectator must respect their cultural commitment to remain wrapped in their traditional burka despite the obvious danger and disadvantage. Perhaps one day the Iraqi team will have their requests granted by the olympic committee and they will be able to perform their races in poorly lit rooms watched only by their husbands, allowing them to be clad in only a respectful all-encompassing onesie. Until that day, they will have to do with just this participation medal.